Kubernetes’ perceived edge in the container orchestration market, as young as that market is today, is neither definitive nor definite. Its survival may yet depend on competitors’ ability to match customers’ expectations for the essential requirements for orchestration. In the future, enterprises may look for solutions that are bundled or included with larger platforms, or they may simply accept those solutions once they’ve discovered they were already bundled with the platforms in which they’ve already invested. The Kubernetes development community needs to address the inhibitors to its adoption, especially among evaluators who have yet to commit. As we’ve seen, agility is more important to people who evaluated Kubernetes in the past but chose another path. We explicitly asked this group, along with the group currently evaluating Kubernetes but not having yet committed to it, what is inhibiting their adoption? We gave these groups a list of four categories of adoption inhibitors and asked them to rate each one on a five-point scale, ranging from “To a great extent” to “Not applicable.” The complexity of Kubernetes implementation was inhibiting adoption to a great extent for 36 percent of respondents. Some three respondents of four in these subgroups cited complexity as an important inhibiting factor to some degree. Yet concerns about complexity were more pronounced among those whose organizations had evaluated and rejected Kubernetes. The other big inhibitor was simply the higher priority for other projects. Some three respondents in five of these subgroups cited higher-priority projects elsewhere as an important concern, with one in three giving Kubernetes’ low priority their highest rating. For these companies, Kubernetes adoption may have to wait until other organizations have found success with it. One other factor was much less likely to be holding adoption back. Respondents made clear their belief that manual orchestration is not an option, with only seven percent of respondents in these subgroups citing a preference for manual orchestration as their key inhibitor. 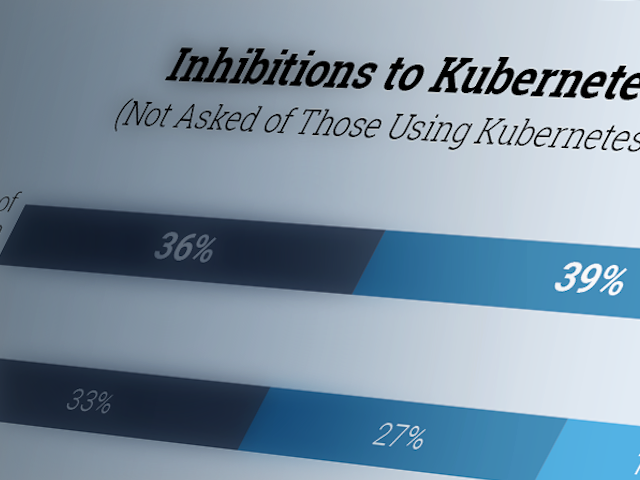 Of those whose organizations don’t use Kubernetes, 42 percent said manual orchestration was no inhibitor at all. Only 14 percent cited their organization’s use of a competitive solution as a significant inhibitor. Is Kubernetes’ Reputation for Complexity Deserved? Kubernetes has acquired a reputation for complexity of implementation, particularly among institutions that have rejected deploying it in production. Is any part of that reputation shared by those organizations that have adopted it? We asked some questions of adopters to figure this out. To give you a better idea of the extent of this group’s hands-on relationship with implementation, some 78 percent of respondents told us they or their teams were directly responsible for implementing Kubernetes. We asked these implementers whether their organizations’ implementation of Kubernetes consumed as much time as they initially estimated, or instead more or less time. Some 38 percent of respondents said it took longer than expected, while only 15 percent said it took less time. Complexity may be to blame, if only partly. For those who said Kubernetes implementation took more time than they expected, the percentage declined as their experience with implementation increased. 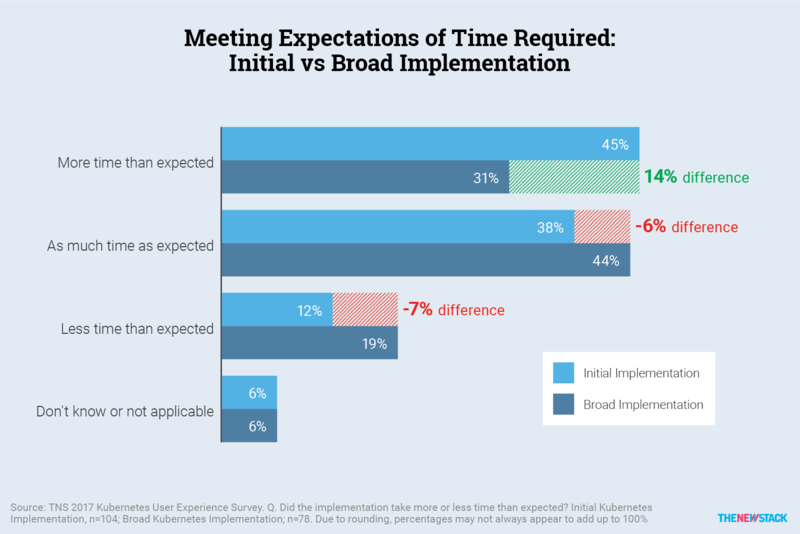 Specifically, those with broad implementations registered 14 points lower than those just starting their implementation, for taking too much time. This clearly suggests that a good number of implementers — though certainly not all — do feel more comfortable with Kubernetes given time, once they’ve taken the plunge. Obviously, the move to microservices architectures is a process that cannot easily be rushed. Is There a Market Opportunity for Easing Implementation? If Kubernetes is complex and takes time to implement, perhaps there’s an opportunity for emerging companies to offer a unique value proposition for helping out. Perhaps. But so far, not yet. 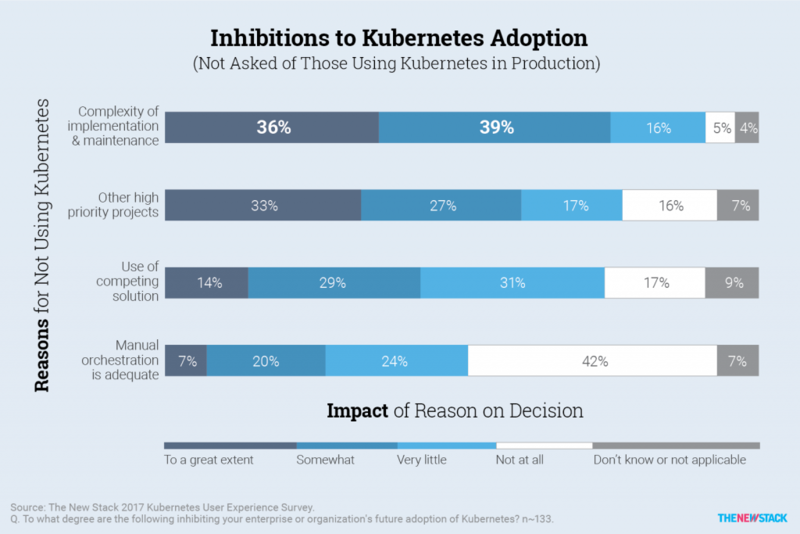 We asked participants in both the initial and broad stages of Kubernetes adoption whether the current status of that adoption has met their organizations’ expectations completely, substantially or minimally. 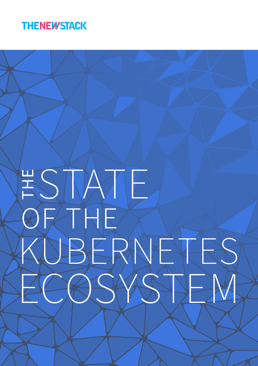 While only 32 percent of initial-stage respondents say Kubernetes has completely met their companies’ expectations, some 43 percent of broad-stage respondents are completely satisfied. That’s certainly the right direction. And although fewer than half of the broad-stage group are completely satisfied, keep in mind that, at just two years of age, the Kubernetes ecosystem, or market, is a whole year younger than what some analyst firms consider a requirement for a mature market. 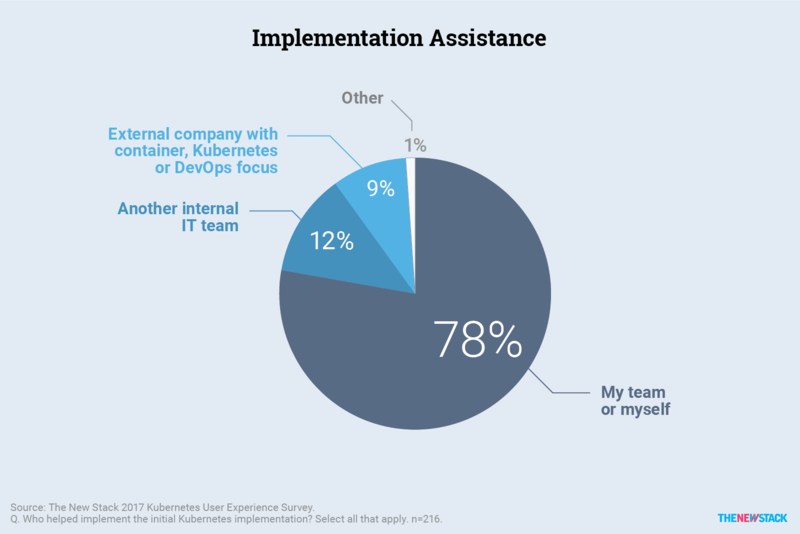 Some nine percent of total respondents told us they did rely on help and support from an external company to implement Kubernetes in their organizations. 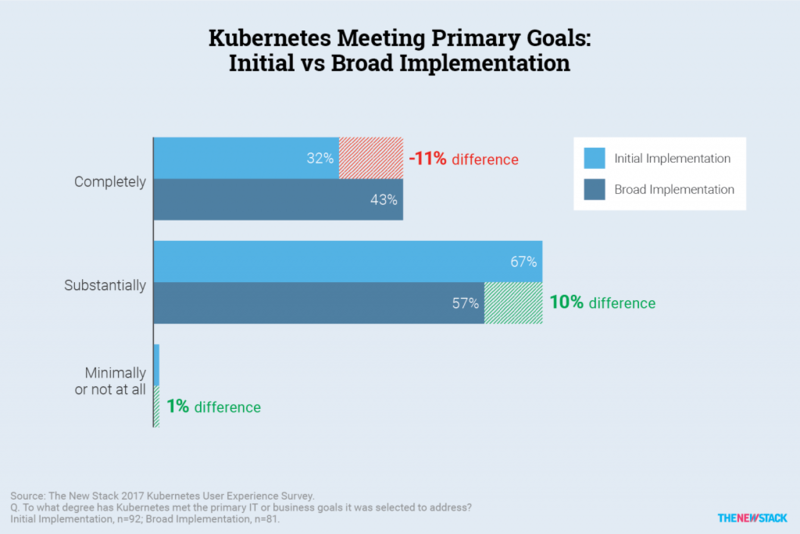 It appears that hiring such a company did have some impact, as only one in five of these respondents (20 percent) said the implementation took longer than expected — an improvement over the 38 percent of all Kubernetes users that complained about time consumed. 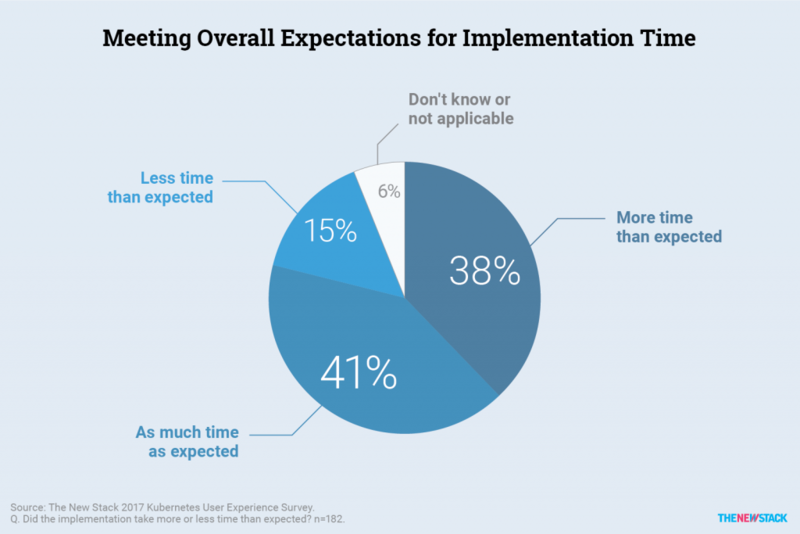 Only 31 percent of people with broad implementations said implementation took longer than expected — another improvement, this time over the 45 percent of those with initial implementations that complained about time consumed. Overall, Kubernetes is winning the expectations game. According to 173 production-level users of Kubernetes, a full 99 percent said the platform has either completely or substantially met their IT or business goals. Granted, these were companies for which Kubernetes passed their evaluation phase. During an evaluation phase, the expectations for a product being evaluated typically become more closely aligned with that product. While using a platform or vendor distribution is supposed to make things easier (at least, so vendors say), this only raised the percentage of those completely satisfied by a few percentage points. With greater investment may come greater expectations. The e-book’s Solutions Directory includes a variety of products and services that make implementing Kubernetes easier. Below are some of the companies that provide consulting services and support to implement Kubernetes. It is noteworthy that since publication, the Cloud Native Computing Foundation launched the Kubernetes Certified Service Provider program to help enterprises pick qualified implementation partners. Apprenda Kubernetes Support: Professional support for Kubernetes to handle both original implementation and ongoing operations. Apprenda offers three tiers of support, including pay per incident. Endocode: A German software engineering firm that has helped provided many contributions to several container-related projects. Provides consulting services associated with Kubernetes. Heptio Professional Services and Support: Heptio is a company by founders of the Kubernetes project, built to support and advance the open Kubernetes ecosystem. Jetstack Container Services: Jetstack is a consulting company focused on helping companies build a container management infrastructure. Kubernauts: Organized as a non-profit, Kubernauts provides training and consulting services. It manages the Kubernauts Worldwide Meetup. Kumina Managed Kubernetes: Kumina is a Dutch consulting company that provides managed services. LiveWyer, Kubernetes Services Managed by: LiveWyer is a consulting company manages Kubernetes implementations and provides Kubernetes training. ReactiveOps: Custom builds DevOps platforms based on Kubernetes. Cloud Native Computing Foundation is a sponsor of The New Stack.